Curie's Eleven — Fine Acts (CC-BY-NC-SA). This means that you are free to share and adapt the content, but you must give appropriate credit, provide a link to the license, and indicate if changes were made. You may not use the material for commercial purposes. And, if you remix, transform, or build upon the material, you must distribute your contributions under the same license as the original. In 1911 Marie Curie won her second Nobel Prize, making her the only person (male or female) to win two Nobels in two different sciences. Image: Wikimedia. 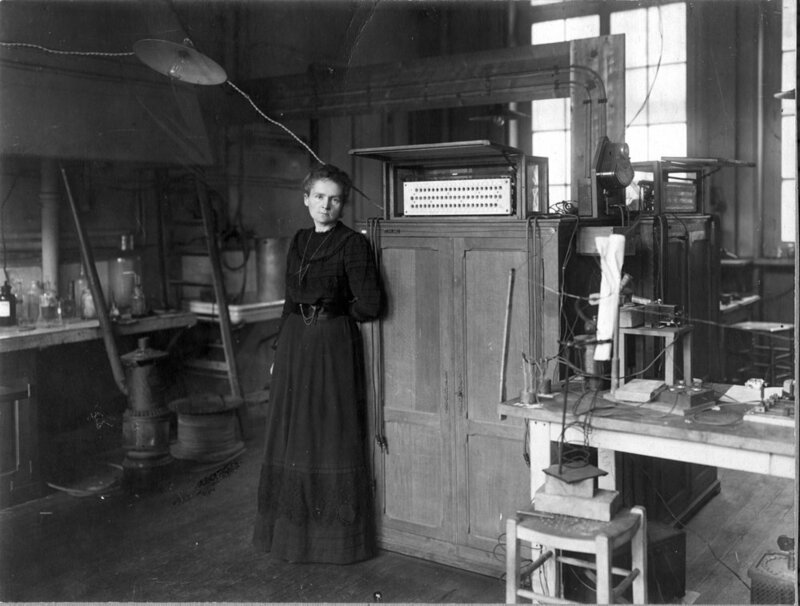 Curie's eleven is A UNIQUE PROJECT ABOUT WOMEN, SCIENCE AND ART. Eleven of the world's most prominent women scientists, and eleven outstanding international contemporary artists converge to shine a light on some of the serious issues women in STEM face today – from expectations about their appearance, to implicit bias, sexism, and invisibility. Scientists each donate a lab coat to the project. Artists use the lab coat as the basis for new artwork. These 11 lab coat deconstructions will emerge from conversations between artists and scientists. The project aims to raise awareness, increase public engagement and ultimately facilitate change. Contributors include: Mona Nemer, Lebanese-Canadian Chief Science Advisor of Canada; Rita Orji, computer science pioneer from Nigeria; Shubha Tole, prominent Indian neuroscientist and gene discoverer; Linda Nazar, pioneer in battery technology and clean-energy storage, and an Officer for the Order of Canada. Curie's Eleven is a collaboration between Fine Acts, TED Senior Fellow Shohini Ghose, incoming President of the Canadian Association of Physicists, and Eden Hennessey, a data-driven artist and research associate with the Laurier Centre for Women in Science.